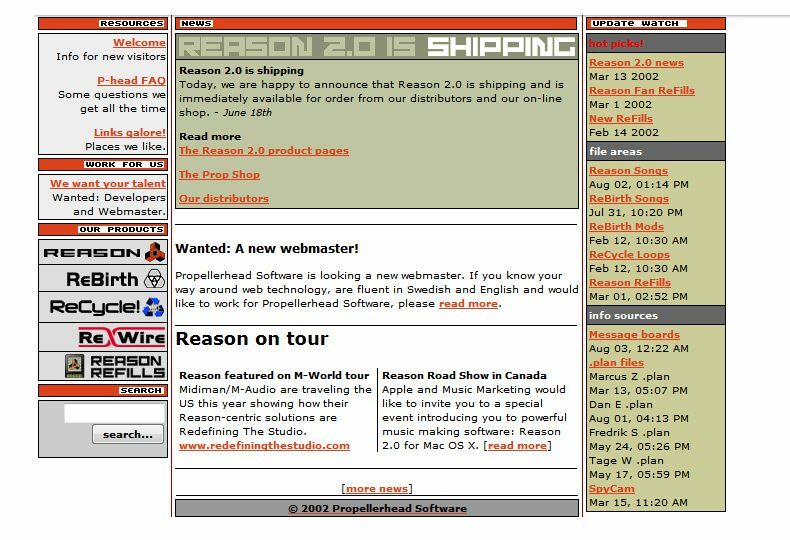 If you haven’t yet heard of Propellerheads’ Reason 2.0 Software, it’s time to come out from under your rock. Reason is a virtual rack of modular software synths, samplers, mixers, effects and MIDI sequencers that is quickly becoming an industry standard in electronic music production. For beginners, the world of electronic music can seem like a formidable task. Reason makes it simple because it bypasses the need for external keyboards, MIDI pachbays and sound modules. Everything is self contained within the program, so all you need is a fairly updated computer (Mac or PC) and a decent sound card. Reason is not a toy, however. It is a very involved, powerful sequencing program. Although not a traditional audio sequencer, the program allows the user to create complex arrangements via external MIDI controller (or by mouse). By utilizing the extensive sound libraries and instruments (included with the program or by third party distributors), there are limitless musical possibilities. Reason also reads WAV and AIFF files so you can load your own samples, in addition to the soundbanks. Starting with one of the program’s 14 channel mixers, just add an instrument, hit record and start creating. The audio of each instrument is automatically routed or can be custom routed by simply flipping the rack around and via virtual patch cords, you can drag and drop the signal routing by hand, to fit your needs. Digital Delay, Reverb, Distortion, Phaser, Chorus, Flanger, Compression/Gate, 2 band parametric EQ, Envelope Control Filter. All of these modules are fully automatable, fully routable and can be added or subtracted at will depending on available CPU power. In addition to being self contained, Reason can be incorporated into external audio sequencing software such as Logic, Cubase, ProTools or Nuendo via Rewire. At the writing of this review, Propellerheads has announced that they will be releasing the Reason 2.5 upgrade. It will include several new FX modules including advanced reverb, vocoder, distortion and DSP modules.